Unprecedented numbers of veterans used benefits of the GI Bill of Rights to attend universities following the end of WWII. Chancellor Tolley was instrumental in advocating for and securing these rights through legislation. 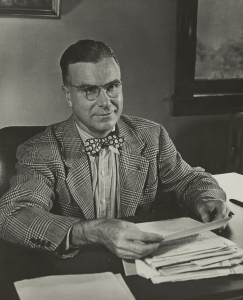 After the war, Tolley opened Syracuse University to any veteran wanting to pursue their degree. By 1947, the University student body had tripled in size with roughly 9,000 student veterans among the 18,000 total enrollment. The Servicemen’s Readjustment Act of 1944, more commonly known as the GI Bill, provided one free year of higher education for every ninety days of service with one additional month of paid education for each month of service up to forty-eight months. This supplement to the 1948-9 Bulletin shows what non-veterans paid for their education, and just how much the GI Bill education was worth. The war department provided 600 pre-fabricated buildings to serve as classrooms, residences, and dining facilities on campus. Although veterans were welcomed and supported by the campus community, many struggled to find a sense of belonging. Most student veterans lived off campus and were separated from non-veterans economically, socially and emotionally. While non-veterans were rushing sororities and fraternities, veterans held cookouts, picnics and parties at their home, thereby forming their own special organizations. 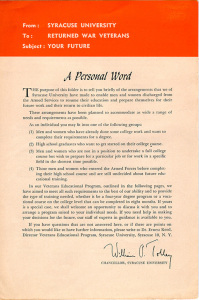 By summer 1947, three veterans’ organizations were active on campus: the University chapter of the American Veterans’ Committee, the Syracuse Veterans’ Assembly, and the Women Veterans of Syracuse. Chancellor Tolley’s Letter welcoming returning veterans to SU. Click to read it. In the late 1930s, about 160,000 U.S. citizens graduated from college each year. By 1950 that number had increased to 500,000. Classroom buildings sprouted up around main campus as well as near Crouse College, Carnegie Library, Bowne Hall, Sims Hall, Slocum Hall and Machinery Hall. 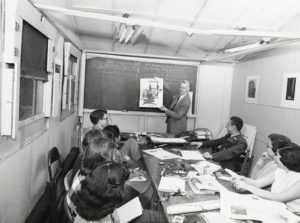 A series of pre-fab metal classroom buildings were shipped in from a California military base after World War II. The interior (circa 1953) shows the cramped quarters students and faculty shared. 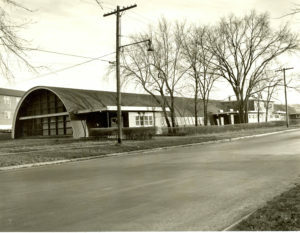 Arguably the most prominent temporary structure was the Quonseteria, a dining hall on Comstock near the corner of Colvin, which was erected in 1947. The name for the structure was coined by Andrew Cisternino of Syracuse who garnered a $10 prize in a competition to name the building. The building later became a Food Service bake shop and store room, the Microbiology and Biochemistry Center, and in its waning years was the home to Syracuse University wrestling team. The Quonesteria was taken down in the 1980s.